2nd Worcestershire Regiment, 100th Brigade, 33rd Division, B.E.F. William Dutfield was born in Malvern Wells and was educated at Malvern Wells School. At some point he moved to Worcester and in 1917 joined the army there, and was posted to the 2nd Battalion, The Worcestershire Regiment. He died of wounds received in action near Epehy on 24th September 1918. The village of Epehy was captured at the beginning of April, 1917; lost on the 22nd March, 1918; and retaken (in the Battle of Epehy) on the following 18th September by the 12th (Eastern) Division. 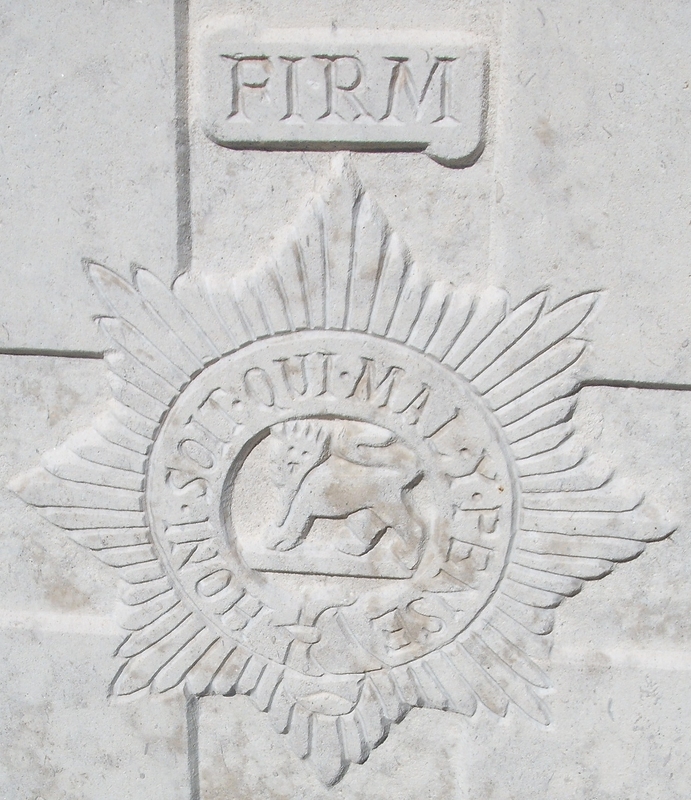 Domino British Cemetery was made by the 33rd Division Burial Officer at the beginning of October, 1918, and named by him from the divisional sign. There are now over 50, 1914-18 war casualties commemorated in this site. Of these, a small number are unidentified. The cemetery covers an area of 255 square metres and is enclosed by a low rubble wall. In September 1918, between the crest line at Epehy and the St Quentin Canal the enemy’s forward positions included tow main lines of trenches, the second line being the stronger and the more definite. That second trench line passed over the eastern ends of both “Seventeen Spur” and “Lark Spur.” The strong field works on those two heights were linked up by “Pigeon Trench” which ran like a long scar across the Targelle Valley between the two spurs. Nearly a mile west of the site of “Pigeon Trench” a deep sunken road called “Gloster Road,” furrowed the valley. Some two hundred yeards west of “Gloster Road was sited the enemy’s first line of defence: a straggling trench line, strengthened at intervals by elaborate redoubts – “Limerick Post” on the crest of Lark Spur, “Meath Post” half-a-mile further north. At dawn on September 21st the supporting British artillery opened fire, and two battalions of the 19th Brigade, the 1st Queens Regiment and the 1st Cameronians, attacked Limerick and Meath Posts. The defences of those two redoubts were strong, and both attacks failed. That evening a renewed attack by the supporting battalion, the 5th Scottish Rifles, succeeded in taking Meath Post. So far the 2nd Worcestershire Regiment had not been actively engaged. Orders were now given that the Battalion would relieve the 1st Queens in the front line and would renew the attack on Limerick Post. After a day of heavy rain, the Worcestershire platoons filed forward after dark on September 22nd and took over the front line. At 5.00 am next morning (23rd September) the British artillery again opened fire. ‘A’ and ‘B’ Companies of the 2nd Worcesters advanced with difficulty across the slippery ground and made a converging attack on Limerick Post. In spite of a storm of German shells the redoubt was reached and was rushed with the bayonet; but no oppposition was met. Save for the dead a few wounded men the defences were empty; the enemy had fallen back. The casualties reported in the War Diary in this attack were 3 killed and 19 wounded, including William Dutfield.